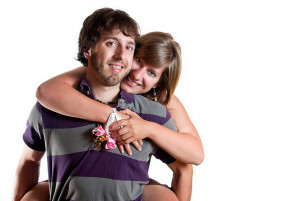 January tends to be a financially stressful time for couples. In couples counseling, we often spend January navigating the effects of Holiday spending, end of year financial analysis (where the “big picture” of how you did financially last year becomes unavoidable), new financial demands in the new year, and differing financial goals for the new year. Some of these stressful conversations are difficult, but ultimately do no damage to the relationship. One type of stressful financial conversation is the exception to this and has the potential to do great damage to the relationship. 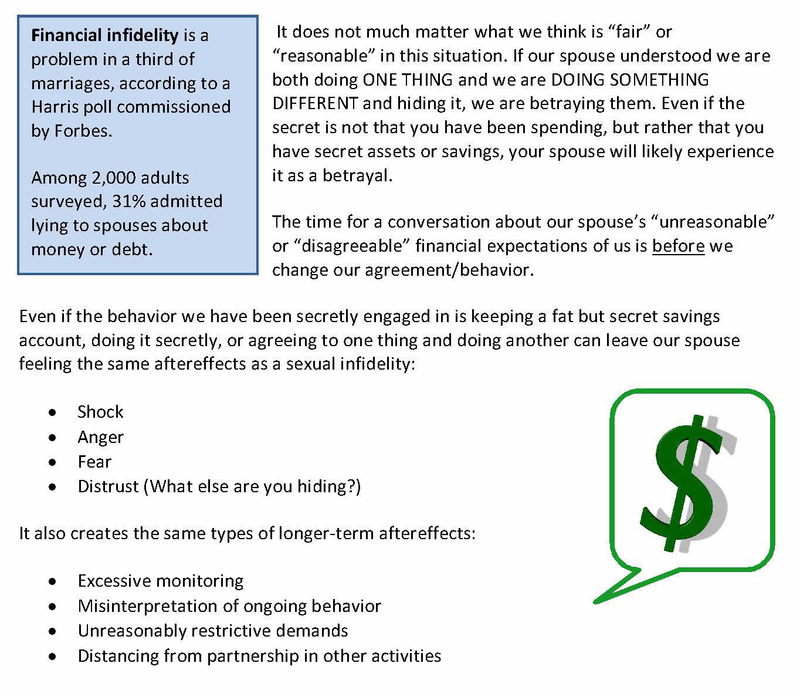 What if you have been hiding your financial behavior from your partner or spouse? Hiding relevant information or behavior from your partner will likely be considered betrayal by them. Whenever we break the explicit or implicit (unspoken) rules of our relationship, it is a betrayal. Feeling like your spouse is not open to your influence or input about money management. Feeling over-controlled, “nit-picked”, or over-managed about money by your spouse. Fear of your spouse’s judgement of you if you disclose a spending problem. Disagreeing with your spouse’s financial goals and feeling you can’t productively discuss it with them. 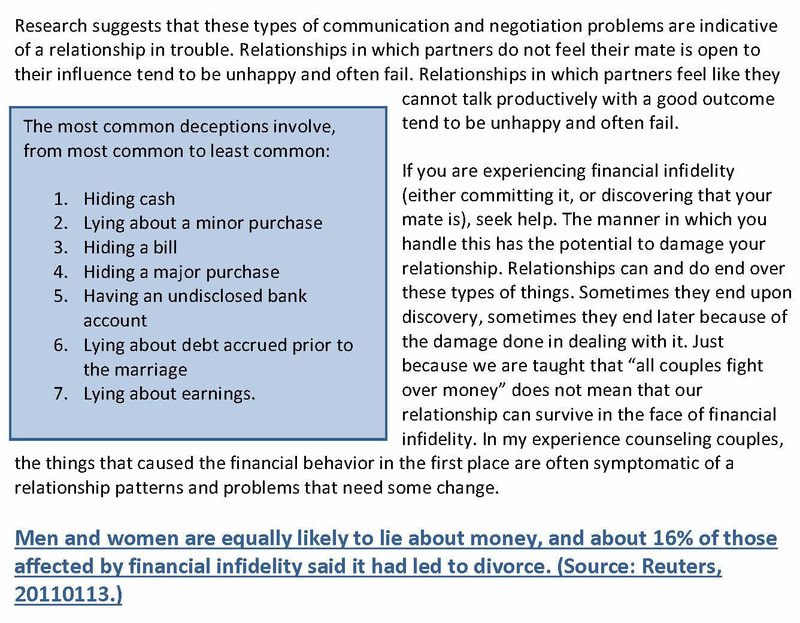 The theme running through these reasons for financial infidelity is a feeling that your spouse is not open to your influence about money (how much to spend, what to spend it on, how much to save, what to save for), and a belief that it “won’t do any good” to talk about it. Both of these beliefs are a good reason to seek out some help with your relationship. Couples counseling can help you navigate this without damaging your relationship further. The issues causing this to happen in the first place will show up in other areas of your relationship, too. It might not be only about money. You might also feel that you can’t talk to your spouse and have a good outcome regarding the differences in your idea of good childrearing, for example. In my experience as a couples counselor, I find that people expect that they would feel less betrayed by financial infidelity than they would by sexual infidelity. When betrayal occurs, however; that’s not how it goes. People feel just as wounded by different types of betrayal. When partners break the spoken or unspoken agreements that form the foundation of their relationship, it damages the relationship. It does not appear to matter what the nature of the betrayal is. If someone feels betrayed, they feel betrayed. It does not tend to happen in degrees. There are no “worse” or “less serious” forms of betrayal. I know that doesn’t tend to fit what we think or expect. Apparently, our expectations on this are not very accurate predictors. When I counsel couples experiencing betrayal of any kind, I have noticed that the effects can be similar, no matter the nature of the betrayal. Couples counseling can help repair the damage done by betrayal, before our reaction to the betrayal makes it even worse. I find that couples who seek couples counseling quickly following a betrayal have less likelihood of further damaging the relationship with their reactions to the betrayal. Financial infidelity is a good example of the truth that, what we expect to feel about something, isn’t exactly what we feel when it happens. One of the top regrets of divorcees is “I did not put my spouse first”. Couples counseling is about creating relationships that work. Relationships that don’t work end in break-up or divorce. Divorced couples say one of the things they most regret is failing to put their spouse first. How would they have done better at this? What does it mean to put your partner or spouse first? You may think it’s obvious, but read below to see what you might be missing. Take time for your partner. Stop what you are doing and listen to your partner when they share. Spend time cuddling, kissing, lounging together every day. Don’t let other things get in the way of the relationship. Spend romantic time, even if you are exhausted from the day. Talk about something other than the kids. Take regular weekend breaks away- just the 2 of you. Stop work to be with your partner. Agree with your partner about things important to them. Take your partner’s side in arguments with others, including your own family. Back your partners up with your children- tell the kids to listen to your mate. As a couples counselor in Raleigh NC, I have noticed that couples in trouble are almost always neglecting to put their mate first. Most of us are generally aware that these things are important. But there is another type of “putting your mate first” that tends to perplex us more. It is #3, above. Take your partner’s side. I find as a couples counselor in Raleigh, NC that people have the most trouble with this one. Most couples who find themselves in need of couples counseling are having distress as a result of getting this one wrong. They do not feel that their partner is on their side, or has their back. When I see a couple in marriage counseling or relationship counseling, its this third category that tends to vex them the most. I think it’s worth some discussion. In the first couple, one partner felt the other disagreed with his parenting too much in front of their young son and was preventing him from having a good relationship with the child by making him look irrelevant or like an outsider to the child. He felt betrayed by his partner, and became angry and ungenerous with his partner. After repeatedly voicing his upset over this situation to no avail, he became snarky and sarcastic about his partner’s parenting. He stopped participating in discipline and withdrew. You can imagine the negative impact this had on their marriage. They learned the hard way to support each other in front of the children and save any concerns or disagreements about parenting for private conversation. In the second couple, a woman was shunned by her husband’s family member. Instead of standing beside his wife and taking her side in the conflict, he continued to have a close relationship with the family member that excluded his wife. He attended birthdays and holiday gatherings with his family, but without his (unwelcome) partner. His wife came to feel unimportant, and turned elsewhere for attention. They learned the hard way that, even with parents and siblings, our mate must have our unwavering support. Because life is often complicated, there are situations where these things might not apply, but in general it is important to come out on your partner’s side. Agree with their perspective. Back them up. Stand with them. Share their upset. If you find you cannot take your partner’s side, then it’s a good time to look into some couples counseling. It damages the relationship to fail in this area. In couples counseling, couples often ask “What if I don’t agree with my mate’s behavior or perspective on things?”. I usually respond by telling them that they had best find something to agree with in their partner’s point of view, and save their reservations for another time. Reservations are best brought up very carefully, and much later. For example, a couple came into their marriage counseling arguing about her hurt that he was critical of her after an automobile accident. He said she drives recklessly. The hurt feelings and the damage their relationship suffered as a result of this argument could have been avoided if he had agreed with her right away that the other driver had been out of line in some way. He could have told her the next day that he had been thinking about her accident and wondering if she had considered her own speed at the time. She would have felt supported when she was upset, if he had handled it this way. Our mate wants to feel supported, endorsed, protected, together. It is harmful to our relationship when we allow situations or people to cause us to fail in this. We all want to know our mate is on our side and has our back. Divorced people point to their failure in this as a regret they have. I think that’s worth hearing. Kathy has worked with couples in all stages of relationships for her entire professional career. Her practice style is relaxed, personal, and informal. Clients have described Kathy as refreshingly straightforward and interactive.